BUTCHER BABIES will remain on the road in North America throughout the Fall. The band, who released their sophomore full-length album Take It Like A Man last month, are currently on tour with the legendary GWAR as part of the group's 30th Anniversary Tour. 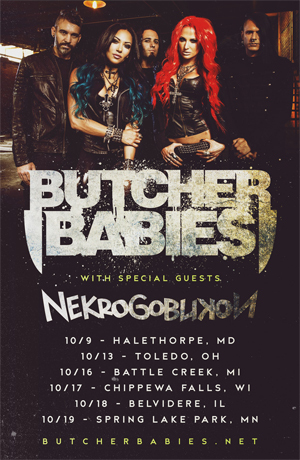 BUTCHER BABIES are excited to announce that they will now embark on a headlining tour this October, with NEKROGOBLIKON joining them as direct support. A list of dates for this upcoming headlining run can be found below. The follow up to their debut effort, Goliath, Take It Like A Man has been a career defining moment that has already seen the band achieve a new level of commercial success and creative intensity. The album's first week sales took them to #13 on the Rock Charts, as well as #5 on the Independent Charts and #76 on the Billboard 200. BUTCHER BABIES have also invited fans to experience their new album in a completely unique fashion, by offering a YouTube stream of the band performing every track off of Take It Like A Man in the form of 11 individual music videos, which were filmed back to back. You can check out this visual experience of the album at the link below.